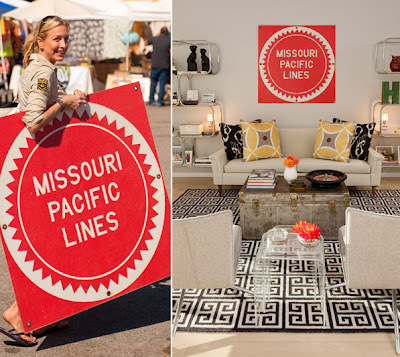 It's no secret that I love design shows. I am slightly obsessed with all things HGTV. My husband will watch most of them with me! However, as a renter its kind of a struggle to decorate our space exactly as I see it in my mind. We can only do so much with existing wall colors and layout. So D and I have been talking seriously about buying a house this year. It makes sense as we are now pretty much set as a family of four and feel as though we are out growing our current space. So it's kind of been fun to watch the people on HGTV's House Hunters, Property Virgins and other design shows experiences. 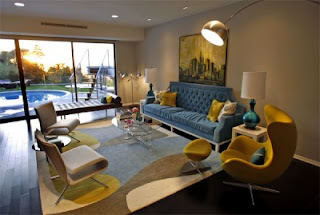 We've learned a lot about what is our personal style and what exactly we are looking for in a home. 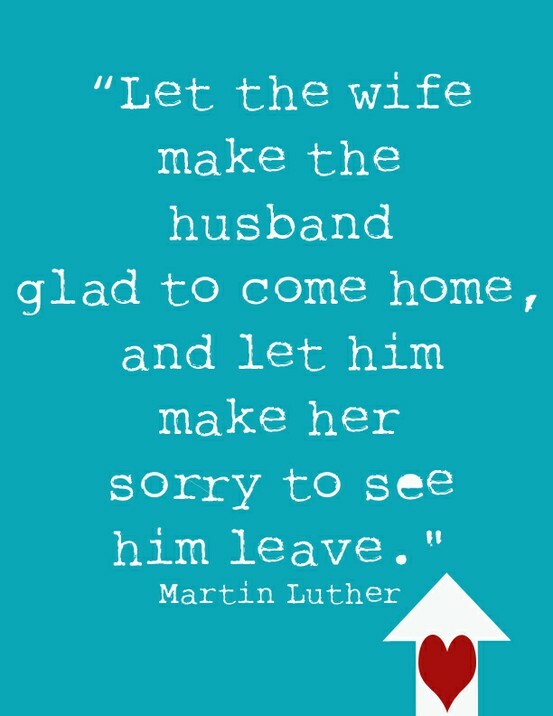 I know my job as a wife and mother is to create a space that we all find comfort in. To make our home a sanctuary of sorts and for me that means having a home with approachable yet modern style. We're not heavily into vintage or ultra modern sleek furniture, we like to entertain so things have to be comfortable and functional. I am also a huge fan of color. Babe not as much. He's been leaning a bit my way as he's seen some of my more "inspired" designs come to life but 5 years ago he lived in a blue & brown wasteland wonderland. And honestly, I was a bit afraid of mixing it up so much and having him hate how I changed things. However, I have some commitment issues when it comes to design and furniture. Also I don't want to spend a ridiculous amount of money on something that I may or may not LOVE in the future. 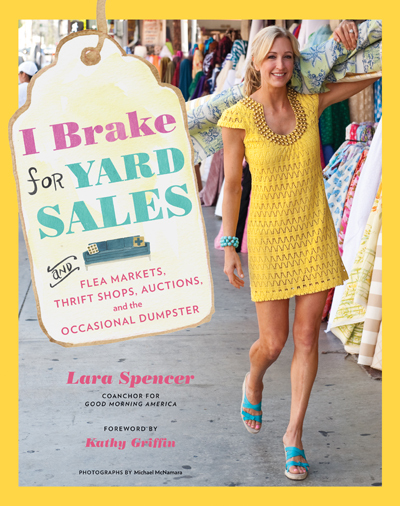 Enter the new show "I Brake for Yard Sales". I'm kind of excited about it. Hosted by Good Morning America's Lara Spencer it follows her as she visits various yard sales and uses those items to decorate friends homes. In the very first episode she was charged with decorating the entire downstairs of her best friends new house. The friend wanted fun, preppy & lots of color (hot pink, kelly green, yellow, orange etc..) which sounds a bit nuts written out but ended up looking A-MAZING. I made D watch it with me so he could really get a feel for how colors & patterns can be mixed together and surprisingly enough he like quite a few of the pieces. It made my heart happy to know he will be open to my colorful ideas. It also allowed us to see how easy it is to re-purpose old/used furniture into what we are looking for without paying a ton. 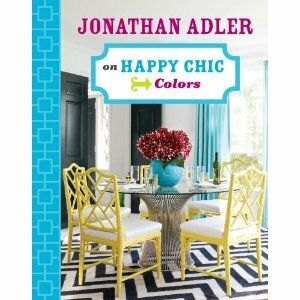 Lara also wrote a book of the same title that I will be purchasing along with Jonathan Adler's Happy Chic Colors. I want a perfectly imperfect home, a reflection of our style and who we are as a family. Not a museum of lovely furniture that I will freak it out if someone spills on. Nor do I want an IKEA ad either. It must be unique no matter what. We currently have a few items in our possession that I am itching to get rid of and update with more fun and functional pieces. Take our dining table &side board for instance, Babe bought it before we were together and while it is quite cute and has been wonderful when having several people over for dinner, its not really our style. Same thing with our TV stand and DVD holders. I'm not really a fan so we will be phasing those out sooner rather than later. among other things but am now seriously considering the cost of re-upholstering our current couch (which I really like) to a lovely shade of grey but that will all come in time. 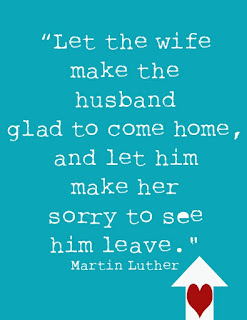 Anywho - please pray for us as we venture out into the home buying world. It's not going to happen in the next week, month or next few months but hopefully it will happen this year. And when it does, watch out! I will be a decorating fool for sure. Do you have any design inspirations/aspirations for your home?